Planet Hugill: Fiddler on the Roof at Grange Park Opera. 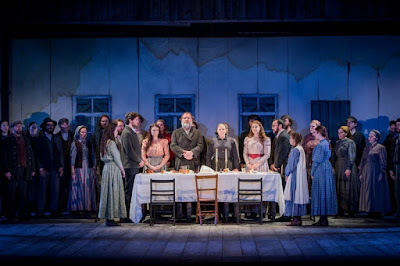 The advantage of seeing a musical like Jerry Bock, Sheldon Harnick and Joseph Stein's Fiddler on the Roof at Grange Park Opera, is that they perform without amplification, and using full, original orchestrations. On 21 June 2015 we caught up with the production, which has the additional attraction of starring Bryn Terfel in the main role of Tevye. Directed and designed by Anthony McDonald, with costumes by Gabrielle Dalton, choreography by Lucy Burge, the cast included Janet Fullerlove as Golde, Charlotte Harwood as Tzeitel, Katie Hall as Hodel, Molly Lynch as Chava, Rebecca Wheatley as Yente, Anthony Flaum as Motel, Jordan Simon Pollard as Perchik, Cameron Blakely as Lazar Wolf and Craig Fletcher as Fyedka. David Charles Abell conducted the BBC Concert Orchestra. I have to confess that I had never seen Fiddler on the Roof before, and had only seen bits of the 1971 film with Topol. But, as with many great musicals, the songs have taken on an independent life of their own and I knew many of them already, but it always improves a song to hear it in the correct context. The musical is based on stories by Sholem Aleichem, and his creation of Tevye the Milkman who lives with his wife and five daughters in a shtetl in Russia in the early 20th century had already generated a large number of stage adaptations before the 1964 musical. It is a slightly curious choice for a musical, in that there is only one major solo role, Tevye. His wife Golde gets only a couple of duets, and the rest of the cast (his daughters and their suitors) each have a moment, but the twin thrust of the musical remains Tevye and the whole ensemble of the villagers. Like a number of musicals from the 1950's and 1960's, there is no big finish; instead the work ends with the Jewish villagers being forced to leave the stetl as a result of the 1905 pogroms and seek a new life elsewhere. The main dramatic and comic impulse of the piece is the struggle with tradition. 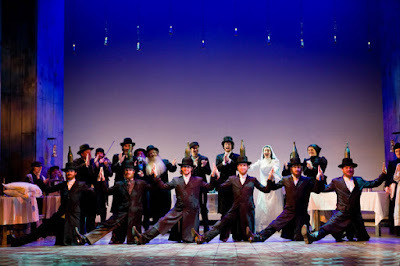 Elkan Pressman, who was the production's consultant on Jewish traditions, suggests in his article in the programme book that Tevye's village, Anatevka, may be modelled on Sholem Aleichem's own village which was near Kiev; if so, then the style of Judaism practised was what we call Hasidic. Within this strictly regulated society, Tevye's three elder daughters struggle to bring in the modern world and each one takes a suitor further and further away from their father's wishes. The ending can be seen in this context, making the whole work a long arc as the secure boundaries (physical and mental) of the stetl and its faith are gradually dismantled. Within this, Tevye is a glorious creation and rightly dominates the show. He is a tragi-comic figure, one who addresses God personally and it is these monologues which give the piece its intensely personal flavour, the character of the lead singer makes a big impact on the whole production. At Grange Park Opera, the role was sung by the great Welsh baritone Bryn Terfel, using his big burnished voice to full effect in the big moments when required to sing over full orchestra, but able to fine it down with a nice edge to the tone so the performance was never too operatic. He also brought immense warmth and personality to the monologues, addressing the audience directly and talking to God. It was a richly characterised performance, and with a nicely wry sense of humour. He sang the best known numbers like If I were a rich man with the right feeling of comic character, but without extra mugging, the songs were simply part of the drama. Tevye isn't Wotan, but the role is taxing and requires a range of skills vastly different to Wagner, and Bryn Terfel showed that he understood how to make things work. The rest of the cast formed a very strong ensemble round Bryn Terfel, yes he shone but everyone else held their own. The cast was a mixture of young opera singers and people with a musical theatre background. The problem of casting actors in musicals is not whether they can sing, but whether they can act with their singing voice. I have heard a number of performances from good actors, with good voices, where the sung item felt added in and not really part of the drama. I never felt that here, all the music arose out of the action and was part of it. Not every voice on stage was great, and it was obvious that some had to work hard to project in the lower register without the help of microphones. But all were characterful actors and there wasn't really a weak link. Janet Fullerlove gave a strong performance as Tevye's wife Golde, making a wonderful double act with Bryn Terfel and creating a lovely sense of Golde's own inner strength. Their duet in the second act, Do you love me?, where they confront the issue of love in marriage for the first time, was beautifully touching with the two finding a nice balance between their very different styles of voice. Tevye's elder daughters, Tzeitel, Hodel and Chava, carry much of the action and were nicely differentiated. Charlotte Harwood as Tzeitel was very much a chip off the old block, as she rejected the marriage with the rich butcher Lazar Wolf (a nicely drawn performance from Cameron Blakely), and persuaded her father to allow her to marry the shy, and poor, tailor Motel (a lovely performance full of warmth and charm from Anthony Flaum). Katie Hall as Hodel developed a relationship with the young radical student Perchik (Jordan Simon Pollard) and both brought out the characters inner strength (she follows him to Siberia where he has been imprisoned). Molly Lynch as the bookish Chava developed a relationship with Fyedka, a local Russian officer (a highly sympathetic account from Craig Fletcher). Rebecca Wheatley was brilliant as Yente, the matchmaker. This is a very strongly drawn role, mining the comic potential to the point of stereotype, and Rebecca Wheatley gave a nicely balanced, but very funny, account of the role. The smaller characters were all well drawn, and fitted into the ensemble of village life with Richard Woodall as Mordcha the ubiquitous innkeeper, Richard Reaville as the Rabbi, and Mark Heenan as the highly sympathetic Russian constable. Also in the cast were Gemma Morsely as Fruma-Sarah and Helen Ogden as Grandma Tzeitel in the dream sequence. Houcheng Kian was the real-life fiddler who wandered evocatively through the whole piece. Anthony McDonald's production, with its flexible layers of set all within a characterful wooden frame, allowed the long first act to flow nicely without any unnecessary pauses. And he clearly had developed a strong ensemble feel from the cast, and with the aid of Lucy Burge's characterful choreography (and there is a lot of dancing in the work), brought the village to real life. Anthony McDonald and his cast could not disguise the fact that the first act is a little too long (if it was an opera it would have been divided into three acts, but musicals are never in three acts), and I could quite happily done without the dream sequence which move away from naturalism into a mock-horror style which sat unhappily with the remainder of the production. When dealing with the essentially tragic nature of the subject matter, Anthony McDonald did not pull punches, but opted for quite a discreetly naturalistic production style. This matched the warmth and general good natured style of Bryn Terfel's Tevye. 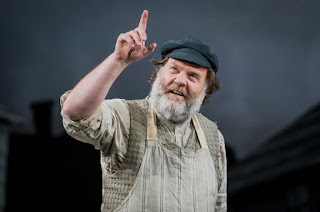 But I think that there was scope to explore the darker side more, Bryn Terfel could have given Tevye's temper more of an edge, made him more fearsome, and Anthony McDonald could have done the same with the threat of pogrom which hangs over the village. The result would have given the piece, and the ending particularly, a stronger emotional pull. The hard working chorus sing the big numbers with operatic gusto, and peopled the village with a lovely sense of individual character. There is plenty of ensemble singing and dancing in the piece, and it was all done with a lovely sense of enjoyment. In the pit, David Charles Abell drew a superb performance from the BBC Concert Orchestra using the original orchestrations so we had nearly 50 players in the pit. The result was a glorious re-creation of the Broadway sound, something you do not hear very often live nowadays, and it paid immense dividends having an experience ensemble like the BBC Concert Orchestra too. David Charles Abell was skilful and sympathetic, do that he drew richly lively performances from the band but the singers were never covered. Anthony McDonald's production was also of immense help here, ensuring that solos were given down-stage. Staging musicals is not easy, the form requires a firm but light touch and it is easy for things to go wrong. 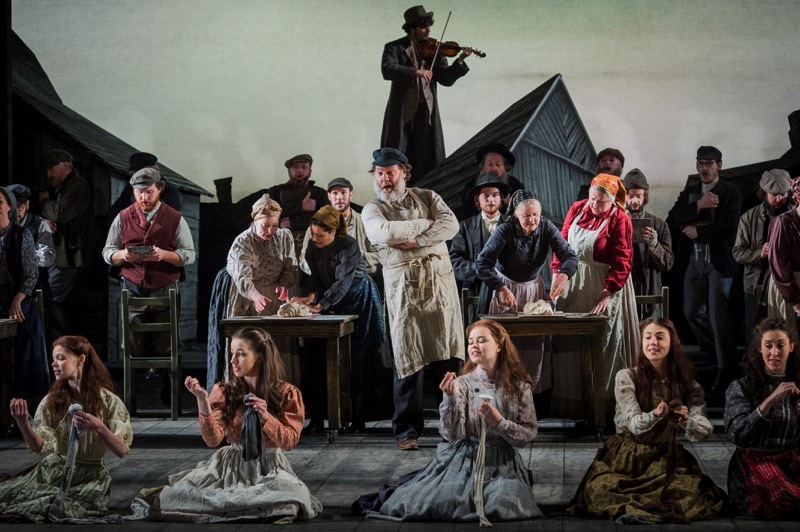 With such a strongly characterised mix, such might have been the case here, but instead we had a terrific company achievement creating the world of Anatevka and supporting the towering performance of Bryn Terfel as Tevye. The production continues its run until 3 July 2015, and will also be presented at the Proms.